It is hard not to feel for Arouna Kone, under pressure after an indifferent start to his Everton career, the former Wigan man has fallen down the pecking order following the hugely impressive start Romelu Lukaku has made to life at Goodison Park. On Saturday, with the giant Belgium out of form, Kone was summoned from the bench and almost instantaneously presented with an opportunity to put a nightmare start as a Toffee behind him. The Ivorian calmly sidestepped the Hull City defence, before curling an effort at goal from no more than six or seven yards out. As the sell out Goodison crowd waited for the inevitable ripple of the Park End net, Kone grimaced as unbelievably his shot cannoned back off the upright and away to safety. The miss would be difficult for the most confident striker to comprehend, but for Kone, a man already suffering from severe self-doubt, after failing to win over the demanding Everton crowd, the ball crashing off the post signaled the latest in a line of missed opportunities. Refreshingly Kone refused to hide and almost immediately made amends, collecting an excellent cross field pass from Kevin Mirallas before firing a shot at goal that was well saved by Allan McGregor in the Hull City goal. Kone is clearly a talented striker, with a strong international pedigree. He made an instantaneous impact in the Premier League after arriving at Wigan Athletic from Levante, leaving the La Liga side after scoring 17 goals in 39 games. He continued that impressive form at the Latics, scoring 13 goals in just 38 matches, as Wigan secured the first top class trophy in their history. It was with little surprise that Roberto Martinez looked to be re-united with the Ivory Coast international shortly after arriving at Everton, especially with Kone available for as little as £6 million, a relative snip for a player with such a strong career record spanning spells in Belgium, Holland, Germany and Spain. 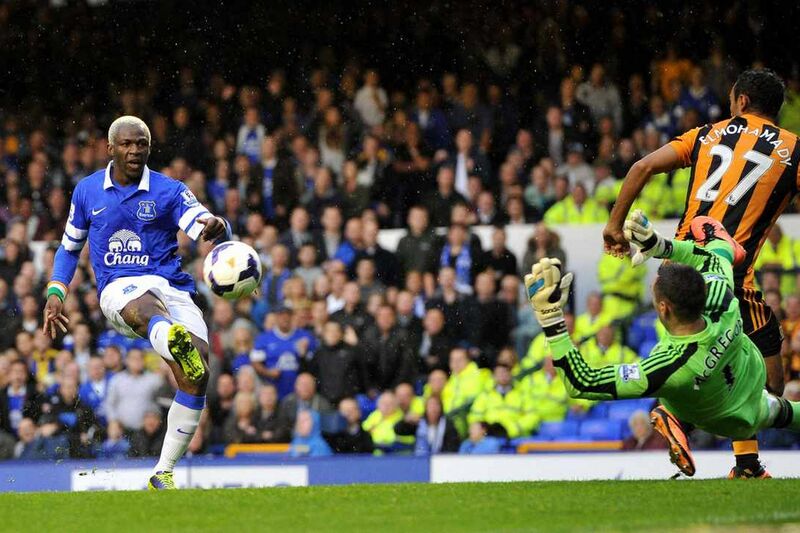 However, since arriving at Goodison, Kone has found life difficult with a number of obstacles in his path. Kone is a deeply religious man, a practicing Muslim, who places great importance in his beliefs. Ramadan, the ninth month of the Muslim calendar fell at the beginning of pre-season training. For 29-30 days, Kone, as with other Muslims, observed a month of fasting and from dawn until sunset refrained from eating or drinking liquids. This made it virtually impossible for Kone to take an active part in the Blues summer preparations, especially with the majority of the training and friendly fixtures occurring in energy sapping temperatures. Kone’s absence from pre-season, he only played 104 minutes of the summer programme, enabled Nikica Jelavic to establish himself as Martinez’ first choice striker and the season kicked off with Kone very much on the outside looking in. Opportunities were at a minimum, and he is yet to start a Premier League match for Everton. He has played a bit part and his chances were not helped after he produced an unconvincing display against Stevenage in the Capital One Cup. In front of an expectant Goodison crowd, Kone failed to make a strong first impression, and produced a below par performance that left many wondering if Martinez had made a huge mistake in recruiting the Ivorian. On more than one occasion, Kone failed to score when well placed, bringing harsh comparisons to past bungling Everton striker Brett Angel. The difficulties faced by Kone, in his first three and a half months as an Everton player, mean that more than most, he needs time to settle. With Romelu Lukaku in such impressive form, Kone has ample time to build his fitness away from the spot light and in Roberto Martinez has the perfect manager, a manager who believes in his qualities. The Evertonians will need to remain patient and judging by the reaction to the near miss on Saturday there is a genuine will for him to do well. He was only inches away from scoring a well taken goal and on another occasion could have been celebrating lift off to his Everton career. Very good article, it’s a shame many of the fan base do not share your understanding of the game. Kone will hopefully come good, we have a good team and a manager isn’t scared of attacking intent hence I’m optimistic for the footballing future.